Question: What can men do to support the women during the women’s convention? Answer: Men have to show the women that they await their connection, communication, and unity, and that they count on their huge common desire that will shake the men and give them such momentum that they will feel the responsibility to rise to another level to fill the women’s Kli, vessel. “While most public policy has focused on restricting children’s access to violent media, the commission found that approach to have significant political and legal challenges in many countries. For that reason, it recommends putting efforts into improving media ratings, classifications, and public education about the effects of media on children. My Comment: Since these media are beneficial to many, it is much more difficult to ban them in our society than smoking. The environment forms a child, but even parents cannot talk in the organized manner against the media that destroy their children and all the efforts of parents to instill good education. Are WHO and UNESCO opposed to these media? Did anyone put forward such proposals in the UN? There is one answer—we cannot resist such media because we ourselves are no different! Question: As part of my job, I have been in contact with several professors lately and among other things we speak about Kabbalah. I must say that they understand the principles, but they don’t believe. Scientists cannot acknowledge the relativity of their perception. They don’t understand that the changes in a person change his reality since it is all created by internal responses. The wisdom of Kabbalah explains this accurate mutual connection; to the extent that I change myself, the world that I feel changes. This is the key formula that has a fixed coefficient and a changing parameter that reflects the vessels, my desires, my sensitivity, my intentions, my thoughts, etc. ; they change and then the world changes. 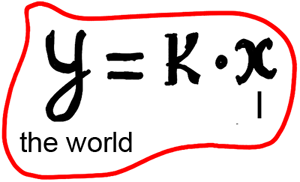 X is me, K is the fixed coefficient and Y is the world. I speak to those who are willing to listen to this. But scientists are not ready for this. They lack a new desire that pulls them out of this world. If they haven’t developed to reach it, they will not listen. One has to be sensitive not only to worldly phenomena but also to phenomena of the spiritual world. Question: So what does that mean? That intelligent people, scholars, cannot understand us? Answer: They are actually the most “resistant” since they are sure that they already have a solid foundation. Question: So who can we turn to then? Answer: There is a Kabbalistic fable about a man named Ptachiya who came to a town and took all the “empty” people to the desert. After all, if the new question about the taste of life is evoked in a person he feels that he is miserable and empty. However, if a person doesn’t feel that, if he has no vessel, no desire that matches it, it means that he hasn’t reached a certain level of perception. We don’t stop disseminating, of course, but only a person who has a point in the heart can hear the message of the wisdom of Kabbalah. The alternative is to feel that you are a beaten animal that has nowhere to run from the endless blows that hit it. Then it will be ready to follow us, just to get rid of the troubles. Everything the authors of The Zohar write about is revealed in the ten Sefirot when we see all of reality as one spiritual Partzuf. Then different phenomena are revealed in it. These phenomena must be tied to one system, and thus we advance. Each time something leaves this system and something enters it, something grows and something stands out, as if it is unstable, and there are different signs of illness revealed in it, evil is revealed. But it isn’t an illness and not evil. It’s the revelation of what needs to be corrected now in order to rise to a higher level. This means that everything that is revealed is always revealed negatively from a higher level. Correct yourself and then rise. Baal HaSulam, Letter 25: It says in The Zohar that the Holy Shechina is revealed to a person who is awarded with repentance, like a loving mother who hasn’t seen her son for a long time, and they made many efforts to see one another, and for that reason they encountered great dangers, and finally they have reached this long awaited freedom and were awarded to see one another and then the mother falls on his neck and kisses and comforts him and speaks to him all day and all night, telling him about her longings and the dangers she had encountered on the way until that day, and how she had always been with him, and had not left him, but suffered with him everywhere he had been, but he could not see that. Judging by what Kabbalists tell us, the Creator, the Shechina, makes great efforts for us, for the souls, by helping us wake up and to gradually come closer by climbing the spiritual ladder so that eventually we will be incorporated in the Shechina and connect to it. In fact, there aren’t any changes in reality. All the changes are only in our understanding, in our perception, until we discover the good and stable upper Providence that doesn’t leave us for one moment and that never changes. Eventually a person attains that all of reality is in absolute rest. Everything that is born in his feelings is the revelation of the vessels that have to be corrected. All the changes are only the appearance of the corrupt vessels, one by one. The feeling of the created being in the vessels that are not corrected is what depicts the picture of the corrupt world for him, and of the bad Providence, meaning that which is not eternal and is incomplete. But if the created being advances correctly, he understands that he has to build external support for himself in the form of the group and a teacher, as it says: “Make yourself a Rav and buy yourself a friend, and judge every person to the scale of merit.” This environment constantly influences him and evokes him. It will shake a person and not let him forget that everything that happens at any given moment is the revelation and the fulfillment of new Reshimot (spiritual genes) through which a person sees the world, and he has to correct these Reshimot. The environment will help him to not forget and that he will constantly be reinforced by it. So “he who chooses a better environment” according to the Reshimot that can be revealed in him in order to be corrected, will not forget for one moment the goal of his life. He has to discover the right attitude and then he will be able to advance to correction until he embraces the Creator. The meeting place between a person and the Creator is called the Holy Shechina. The created being prepares the desires, his vessels, according to which the Creator is revealed. Thus we attain adhesion which is the goal of creation. Question: Some people are more sensitive to certain actions and others are less sensitive. How do you recommend working with the declaration of mutual guarantee so that it is actually imprinted on everyone’s heart, so that everyone lives by this document and together we made addition to it? Answer: The fact is that it is impossible to do all the time. But even a simple impulsive influence on a person, when you create this possibility in him and he inevitably rises above his egoism to the extent to which he begins to receive from you a sense of security, absence of any problems and worries, it pushes him out of our world. After all, we feel the whole world in the property of anxiety and constant worries because our ego forces us to think and act in this way. That is why even a spontaneous influence on each other, which creates a feeling of mutual guarantee in a person even for a short period of time, gradually cultivates in him such a drive to rise above himself that he really starts to seek how to make it permanent. Thus, it becomes a means of our progress. I hope that as a result of our efforts at the convention in the desert we will reach at least this specific letting go of our world. Then people will have the taste of exiting from our world, and they will begin to act in a more goal-oriented way. Question: How can I use this at the morning lessons, workshops, meetings of friends, and shared meals for the preparation to the convention? Answer: You need to act in the same direction: Constantly do these exercises, hoping that through my aspiration, my inner effort, I will influence the friends to feel my concern about them and get rid of their egoism. After all, there is absolutely no need to wait for any special event; you can go back to it every day and every hour, and in the end we will succeed. Help Me Cope With Men! Question from women: Why have you decided to organize a women’s convention for the first time in history? How have we deserved it? Answer: This is due to the fact that above all we men need your support and your pressure. It’s not the first time I’ve talked about this, but now we all miss it very much: both men and women. As the head of the world group, I am very interested in a serious women’s group that will unite and give men overall strength, a common desire, that will be organized correctly and put pressure on them. It’s very important for me. Help me cope with men! Question: What should be the result of the women’s convention? In what state should men be in after it? Answer: After the women’s convention, men should feel that they are obliged to carry out the women’s will. We learn this in Kabbalah. Women’s desires/Aviut rise to the men’s desires, and the men realize them. That is how things work in nature. Baal HaSulam, “Body and Soul”: And they depict the body as an electronic machine with wires that stretch from the body to the brain, and operate by encounters with external things. Also, they send their sensations of pain or pleasure to the brain, and the brain instructs the organ what to do. Question: Is everything the body feels, is all our life actually like a “movie” that is being projected to it? Answer: There are two approaches that are integrated here, the subjective and the objective. On the whole, if you already see, if you perceive a certain picture of the world, you cannot erase it and say that it is your imagination. It may be your imagination, but this “imagination” is our life and we have to accept it as a fact. Question: So where is the truth? Answer: There is no truth. Everything is relative with regard to a person. There are seven billion people on earth and each one has his own truth. After all, we don’t have an absolute scale according to which we can measure the truth. We are all hanging in space, just like earth, just like the whole universe; who knows where he is “hanging?” You are alive now, but in a moment you may be dead, and who is controlling this? In whose hands are the strings? In our current state, when there are no basic standards, we cannot measure things accurately. We have established many systems and measuring units, which are relative: the Greenwich meridian, a kilogram, a meter, a watt, an ohm, but these are relative units for comparative measurements. They only confirm the fact that actually there is nothing we can hold on to and that we cannot actually measure anything. We don’t know what the truth is, and we agree on a certain framework of nominal comparisons since we need a common language in order to lead a normal life. Otherwise, how would we be able to keep the connection between us and to live off one another? So there is no truth. No one needs it. If people discover something that is absolute, I would have to accept it as a fact, and I prefer my own “truth.” It is true that we can reach absolute values, but our ego doesn’t let us do that, and so we are immersed in relativity and instability. We have to get used to this state and to accept it, to accept it as a fact. It is normal to show that I have changed with regard to yesterday. A person who advances understands that nothing is certain and stable. If what was good yesterday also seems good today, it means that I am “still,” not even on the “vegetative” level, but on the level of “still nature.” On the “speaking” level, however, I see “an opposite world” each day. After all, every level is opposite from the one that preceded it. On the spiritual path, I don’t simply add new things to what already exists; I am transforming each time and there is nothing to be ashamed of. There is no need to be an “indestructible rock”; we are all constantly changing, which is good. Only small children who are constantly restless and uneasy can grow. Well, we cannot determine that anything is absolute, and so we have to believe that “a judge only has what his eyes can see,” and to accept this picture as real. There is only one truth—that there is nothing stable, and that everything changes with regard to a person.